We are a small family run bakery business which employs 10 local people. Produce sold in the shop is made and baked on the premises. Auntie Annes’s Bakery is a small family run business Where we make and bake everything on site. Just through the window in the shop, you will see Auntie Anne and her colleagues busy baking and preparing the delicious treats for the shop. We are very traditional bakers – in both our methods and raw materials, producing lots of items that your Grandma would make on her baking day, many years ago. 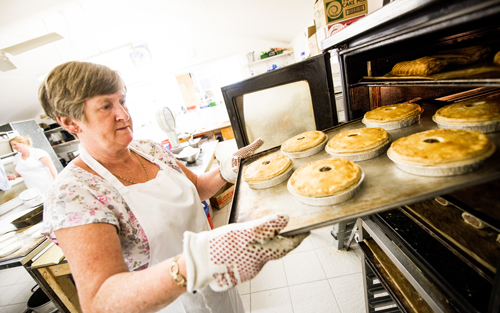 We make a large variety of products ranging from bread and rolls, to steak pies and chocolate cakes. Our ingredients are sourced locally where possible, with the steak used in the famous pies coming from the local butcher in town and the eggs and milk coming from a local farm.